Each Fado in this collection has been carefully chosen to expose David's deepest passions, with gratitude to a higher divine power, the sharing of a love story, and pride in the Portuguese people. The musicians from Sete Colinas have been the backbone for his journey through Fado. Their support, along with his family and friends, has helped lead him into this new chapter in life. 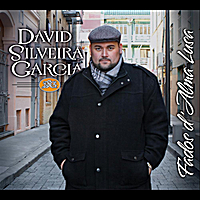 Come share with David Silveira Garcia the beauty and emotional depth that Fado has to offer. "...unexpected surprise. His baritone voice and unassuming personality made him an instant hit with the folks at his debut." "...a surprise of the night... he left us with the best impressions..."
"... only like this can our local artists acquire the confidence e show all their value to the entire community." "...If David sang opera he would be the Portuguese Pavarotti. He has a strong voice that fills a room."